The Local Board recently made a decision that has caused some concern amongst local groups and individuals. I thought that I should set out the decision, the reason for the decision, the implications and what I think will happen in the future. It was not intended by me that the park be annexed from the Regional Parks Network, just that the board had a significant role in their management. The resolution was part of a larger resolution that considered the division of responsibilities between Council and the Local Boards. There has been some tension in resolving this issue. My clear impression is that Council is struggling with its workload and to be frank the local boards could be delegated more to do. The process of forming super city has been that rushed that the division of responsibilities is a mess. The principle that is talked about is that of “co governance”. Local Boards are meant to make decisions with local effect and provide local representation on issues. Auckland Council is meant to provide regional governance and deal with regional issues. The provision of the Act that applies is section 17 of the Local Government Auckland Council Act 2009. The provision is complex but the default position is that decision making should be exercised by a local board unless the nature of the activity is such that decision making on an Auckland-wide basis will better promote the well-being of the communities across Auckland because the impact of the decision will extend beyond a single local board area, or effective decision making will require alignment or integration with other decisions that are the responsibility of the governing body, or the benefits of a consistent or co-ordinated approach across Auckland will outweigh the benefits of reflecting the diverse needs and preferences of the communities within each local board area. In deciding on this particular issue we were responding to the test set out by concluding that we did not think that the circumstances justified a change from the default position. It was not a desire to annex the parkland, rather the recognition that the parkland is an integral feature of the local board area and that local residents should have a significant say in what happens with the parkland. The problem with section 17 is that it is an “either or”. I have always thought that some sort of shared responsibility would be best but in addressing the section the board does not have this option. It should also be emphasised that the section talks about “decision making” and this is why that particular phrase was used in the resolution. That phrase is not defined in the Act. Local communities will have a greater ability to know what and be involved in what is happening. Decisions will be made locally and reflect local feelings rather than those of Aucklanders who may have no interest in the park. Local aspirations can be represented. A regionally strategic overview of the network can be continued. Resources and personnel can be more efficiently used throughout the region. I do not believe that the local board needs to employ its own group of rangers. My preference is that there be significant local input but for strategic reasons I agree that central control is preferred. The budget sits with the Auckland Council and there is a real benefit and strength in treating the parks as a regional asset. Rather than an “either or” I prefer that some sort of hybrid is developed. Local input can occur by having any agenda items dealing with the Waitakere park included on our agenda and by us providing feedback on issues. Regular briefings can occur. Sandra Coney has suggested this and I believe that this is a good suggestion. And this would have the benefit of keeping local communities involved in what is happening. Comments welcome. I can assure everyone that Denise, Neil and I are passionate supporters of protection of the Ranges and would not do anything to lessen current protection. Kia ora. Brian Rudman expressed my views in his column today [Friday, 9 Dec.]. The Regional parks should stay that way – regional, rather than be at the mercy of local politicians who would find it too easy to sell them to developers. Besides, the local boards are poorly funded; how would they find the money to maintain them? Sadly, the environment is too often a low priority. I believe Local Parks fall in the local unitary plan, therefore it would be better served by local boards… I am really in no position to talk about sell off of our Parks, environment is not a low priority in Waitakere, however there could be some tourism revenue generated out west which will benefit the economic status. This is the document we were responding to. As Greg has indicated, the restrictive way the Local Government Act was set up only provided us with an either or response, which was quite unsatisfactory to us as a Board, as we are damned if we do and damned if we don’t. To reiterate that we were seeking some thing more than just input or consultation but that at no time were we advocating annexing the park from the Regional network. In the Committee meeting above it is apparent that our underlying, implied request for greater input by the Board was similarly understood by Auckland Council . Under Other Decision Making Options, p241 of the same document, “Other decision-making options. The focus is currently on the allocation of decision-making responsibility to local boards. However, there are other tools available to the governing body to involve local boards in the decision-making of Auckland Council. These include the following. Delegations: The governing body can delegate its decision-making responsibilities to one or more local boards. This is not limited to regulatory decisions. The governing body can also delegate its non-regulatory decision-making responsibilities to local boards. A delegation allows for far more specific and detailed decision-making parameters than the allocation, and can be better tailored to specific circumstances. This is particularly useful in circumstances such as the following. that park to the relevant local board. • Where the governing body wishes to delegate a recommendatory role to a local board. significance (such as the Waitakere Ranges). This consideration of a heightened formal recommendatory role is what I understand to be the essence of what the Board was trying to achieve. It is not an attempt to take control but to simply gain a place a bit closer to the table so that we are not always collecting the scraps off the floor of last nights feast. Finally, we must remember that the ARC is no longer with us despite the fact that we continue to enjoy the legacy of its Regional Parks Network largely unaltered. Change IS afoot though, and an examination of the status of ALL the parks in the Auckland Region was already underway before the Waitakere Ranges responded to the above Allocations paper. The mobilisation of various concerned groups around Auckland in response to the challenge presented by the Waitakere Ranges Local Board, especially with it being synchronous with the renewal of Joint Residents and Ratepayers meetings in Waitakere,can only be a good thing. Forewarned is forearmed.Even the ARC was not perfect as a recent email circulating about the mahurangi Coastal Trail indicates, so why would we expect Regional Parks under the new Council to be different.(http://www.mahurangi.org.nz/Coastal-Trail/Mahurangi-Coastal-Trail.php). Local groups made a difference in Mahurangi and Local groups and Local Boards can work together to make a real difference in the future. The minutes need to be able to stand alone. “decision making and oversight of the Waitakere Ranges Regional Park should be allocated to the Waitakere Ranges Local Board” is a clear statement of a desire to take over the running of the Park from the Regional Network. If that is not what you intended you shouldn’t have made the resolution. Thank you Greg and Neil for that clarification. I agree with Kubi. From what you have said it is clear your resolution needs to be changed to accurately reflect your intention. In doing this please remember that the political make up of any Local Board will change over time and the passing of the Heritage Area legislation was intended to give long term certainty over the future of the whole area. Let’s not fall into the trap of having the regional park suffer from changes in political makeup of the board every 3 years. Ann’s statement about increasing tourism is one of the key dangers to managing the regional parks with a local focus rather than a regional one. 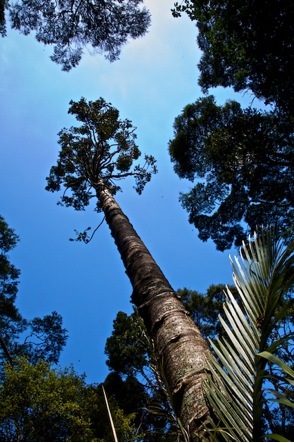 The Waitakere Ranges is a class 1 conservation park in the regional network – that is its main purpose. There are other parks in the network more appropriate for handling increased visitor numbers & different types of recreation that would be damaging to the ecology of the Ranges. If you only look at one park and not at the network as a whole you will manage it in a completely different way – this is why they need to be managed regionally not locally. Have local input yes – but that is only part of the equation and certainly not the solution to a better managed park. The bridge Cimino shows is attractive but Puhoi River is a wide span and I would predict that there would be opposition from some quarters. The current Regional Parks Management Plan has quite an emphasis on non-car-based access to regional parks but this is easier said than achieved. One of the attractions of the Te Muri purchase was its closeness to the metropolitan area. There are proposals for walking, riding and kayaking trails using regional parks that are being discussed and developed right now. One of the many advantages of the regional parks network is being able to plan and make decisions across the network – eg so that recreational activities can be planned for in the right locations. For example, trails can be developed for mountain-biking and horse riding at suitable parks so they can be kept out of the Waitakeres (except for horse riding at Pae O Te Rangi) where they could cause damage. Waitawa was purchased and is being developed to cater for recreational activities where there is growing demand to take the pressure off other parks with high conservation values. Regional parks have policies about consultation and relationships with local communities and interest groups and talk and meet constantly, that is either through officers and also through councillors. There are also at least a dozen “friends” type groups with more formal arrangements. Any person or group can come to regional parks or myself directly and I welcome that. We understand that the shortcomings of the Local Body Act which has amalgamated Auckland has given rise to your response, but your minutes were ambiguous. We do not think that the co governance model will work under the present legislation but absolutely agree that the local board of the area should be consulted in regional park decisions, and their considered opinion should carry weight. However, the network needs to be managed as a whole for a myriad of reasons. The local boards should also have input into the classification of parks which I understand is going on at present. We predict that this is only the first instance which will demonstrate how inadequate was the thought that went into the setting up of Auckland City a year ago!